Ben Nevis is the highest mountain in England and across the UK. This peak reaches only 1343 meters and is not the highest in Europe, but mountain climbing here is one of the biggest challenges for climbers and mountaineers. Ben Nevis rises near the Scottish Highlands, in the Grampian mountains - mountains of the mainland of Scotland, occupying the northern part of the country. Ben Nevis dominates the region of Lochaber. Nearby is the beautiful Loch Linnhe, but the base remains in the scenic valley Glen Nevis. Near Ben Nevis is the second largest peak Ben MacDui which reaches a height of 1309 meters, located in the region Kairngorm. In geological plan, Ben Nevis is a mountain, older than the Atlantic. Ben Nevis is built of granite, gneiss, marble and quartz. From this mountain region in the Grampian mountains of Scotland are traced many rivers, including Spey, Don, Dee and Tay. Ben Nevis is defined as "munros". With this concept are denoted Scottish mountains, higher than 914, 4 m Ben Nevis is one of a total of 284 munros. Near the mountain is Fort William, located in Valley Glen Nevis. The city is large and important communications, commercial and tourist facility. Among its landmarks is a castle built in the 17th century, which for a long time was the only populated location in the local Scottish Highlands. The majestic Ben Nevis begins to rise from the shores of Loch Linne, above Fort Williams. 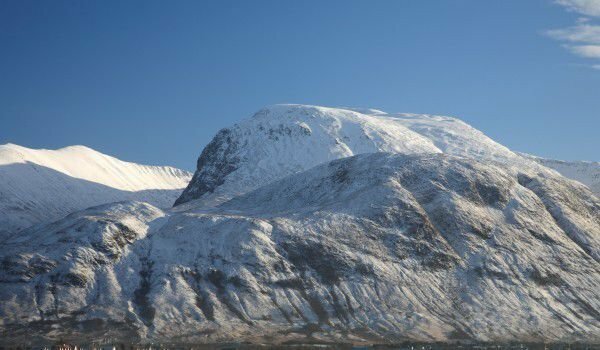 The Celtic name of Ben Nevis is Beinn Nibheis, which in Irish and Celtic can be translated as poisonous and scary. Even today the mountain peak largely retains these characteristics with regard to its ascent. The conquest of Ben Nevis in the north side is an ambition of thousands of tourists and climbers who come here each year. This hill is well known and experienced and professional mountain climbers from around the world each year visit the mountain. Annually, it is visited by around 100, 000 people. The tourist office in Fort Williams is about 6 km from the mountain. It is a binding site for anyone going to climb the summit. Most of the year Ben Nevis is surrounded by clouds, often the temperature is below freezing. Variables of the Scottish climate must be considered. The office has tourist maps, routes, guides, etc. Climbing to the top of Ben Nevis is not a problem, so equipped and familiar with the area climbers each year in September organize a race to the summit and back. To conquer the summit, you must pass a 16 km climb that takes about 8 hours under conditions that move the most popular tourist routes. The last 300 meters of conquering Ben Nevis are very steep terrain. The peak itself consists of a large rocky plateau of about 40 hectares. There are the interesting ruins of the old observatory. Rocks of Ben Nevis are covered with a carpet of mosses and lichens. The mountain is a good place for bird lovers and snow bunting, snow grouse, rock eagles, Kestrels and other birds are found here.